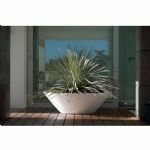 A large range of Bowl Planters, hugely popular with garden designers, these are very effective planted up traditionally or used as water garden features. Our bowls are made in two materials, polyethylene resin and fibreglass. Both are colour safe, will not fade and are completely frost proof. The fibreglass range can be ordered in any colour and is particularly effective in a metallic finish such as the striking dark copper.